No, living at the terminal does not mean you are rodentless (and I don’t mean gopher). In fact, there is very strong mouse support for you, and your text-only lifestyle. If you actually sat through that whole gif, I applaud you. If you could make out what was happening, then doubly so. You’ve got both left- and right-button functions, middle button and/or mousewheel — depending of course on the application. Highlighting is (mostly) done by holding down the shift key. You can see most of the practical use there, with elinks. The home page suggests it’s wired for the console and for xterm, but I don’t use xterm so I’m not sure what the special benefit there is. Aside from elinks, vim I think, Midnight Commander and maybe a few others, I’m not sure how much practical gpm support is out there. If you know of something, please share. P.S., depending on your system, you might have to manually start the gpm daemon. 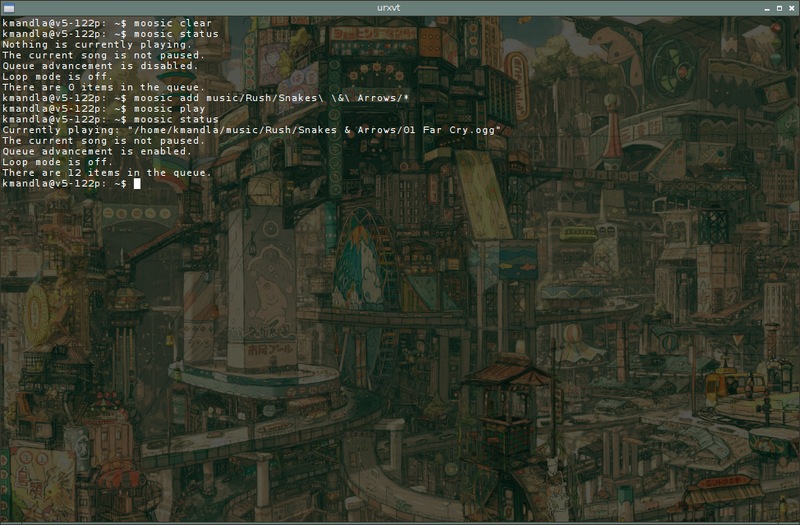 In Debian I think that’s taken care of for you, when you install gpm. In Arch, you’ll need sudo systemctl start gpm. Enjoy. This entry was posted in Linux and tagged button, click, daemon, input, mouse on 2013/11/16 by K.Mandla. I knew the B section would have a lot of bittorrent software in it. I didn’t know so many of them would fall by the wayside as abandoned or unbuildable. Regardless, here’s one that’s strictly business: btpd. And as you might have guessed by its name, this is strictly a daemon. Sort of. 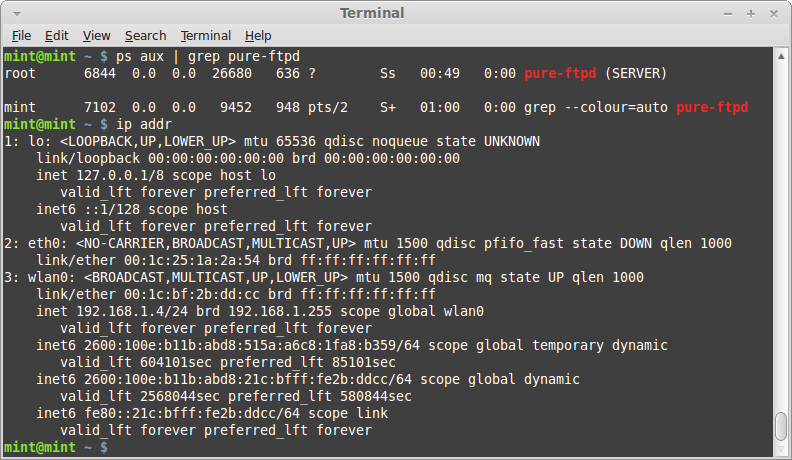 See, btpd alone comes with btcli, which is sort of like a taskmaster for the daemon. You set some options through the daemon, like I did above by choking my bandwidth to 30Kbps down and 10Kbps up. But btcli is how you add, start, stop, list or check the status of torrents that are running. And you can set the btcli stat command to refresh after x seconds, and you get a rolling update of whatever btpd is up to. No, it’s not really an interface. It just spits out data. But I guess we’ve seen lots of applications like that in the past … remember dstat and ethstats? Not much different in that way. On the plus side, btpd is extremely light, taking up only the tiniest sliver of memory and CPU on this machine, which isn’t saying much but I thought worth note. Some low-end machines lose out on interfaces and fancy menus. If that’s you, btpd might be what you need. This entry was posted in Linux and tagged client, daemon, torrent on 2013/09/13 by K.Mandla. 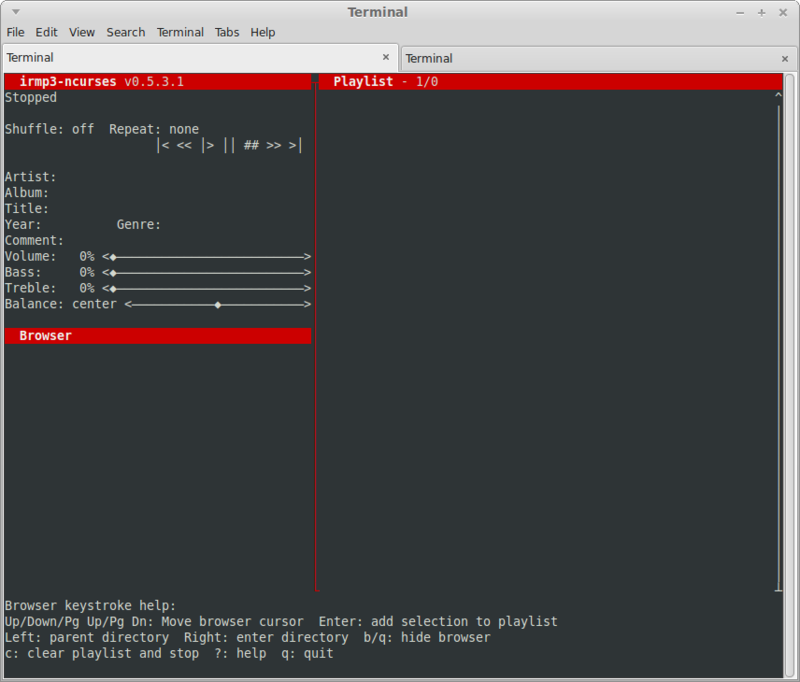 draai is, as the home page explains, a wrapper for mpc. For those of you keeping score at home, that makes draai a wrapper for a client for a daemon. I have already embarrassed myself by talking down about mpc and mpd; I figure I can’t do much more damage by bringing draai into the mix. On the one hand, draai does simplify things a bit. draai understands most of what I think are underlying mpc commands (like draai play and draai stop). But it also adds a few nifty flairs. For example, draai can send status information into the system logs, if I understand correctly. It’ll also show you a burst of future tracks, and information for each one. You can also set draai to start or stop itself at a particular time, meaning it could be a kind of console radio clock. There are a few other perks in using draai over vanilla mpc, but I will let you explore. The README file explains most of them. One caveat: As best i could tell, there was no way to run draai outside of a zsh shell. Whether or not zsh is in your repertoire is your problem to solve; it may be worth it to run zsh just to get at draai. This entry was posted in Linux and tagged audio, client, daemon, music, player, wrapper on 2013/08/01 by K.Mandla. mpd doesn’t corner the market on music daemons. And mpc isn’t the only client that can do the job either. 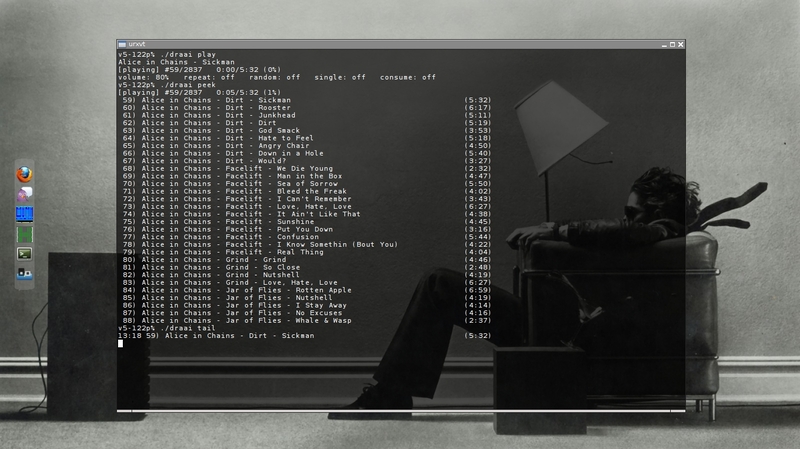 Here’s moosic, a slightly simpler frontend for a similar approach to music playback. Almost identical, except perhaps with the difference in ease of setup: moosic has almost none. No, really. I didn’t even start the daemon. moosic did it for me. I gave it the add command, then play, and off it went, happy as a clam. moosic probably has fewer commands than mpc, but of course I say that knowing very little about how to use mpc efficiently. On the whole, I’d have to call moosic a simplification of mpc, but with the same overall result. Next time I need something like mpd, but without the (harumph) hassle of setting it up, I’ll come looking for moosic. P.S. : Python alert again: If you need exceedingly light software, this one might be sluggish for you. This entry was posted in Linux and tagged audio, client, daemon, music, player on 2013/08/01 by K.Mandla. My original plan was to skim through each and every audio program I had on file, check to see if it actually worked, and if not, list it here, on this page, as a potential null set. I’m going to deviate slightly, only because I already have a fairly strong idea who’s playing on the team, and who has drifted off into infinity. benmp3 and ginetob, as I more or less already knew, end up in this category. Both lack source files, to the best of my searching. I don’t have much to say about yauap, except that it spat out errors when I compiled it in Arch, so I transplanted a version from Debian Squeeze. That behaved itself, but refused to play either ogg files or mp3s. That may be an issue with gstreamer-(whatever), or just a problem with my surgical skills. Musicus and its frontend Cjukebox may just be so far out of date that they require heavy code repair. I managed to circumvent one small compile error by adjusting one source file, but after a second one appeared, my bag of tricks was empty. jinamp, which I think was intended as a successor to benmp3, will compile for me in Arch, but doesn’t seem to play anything. There’s no interface either, it seems, so running the program is a bit … uneventful. Similar problems for cxfe. Won’t build with the AUR package. Debian and Ubuntu are oblivious to this. And the link on the home page to .deb files is dead. pytone has been around a while, but I’ve never seen it run. It must have worked for someone at some time in the past though. 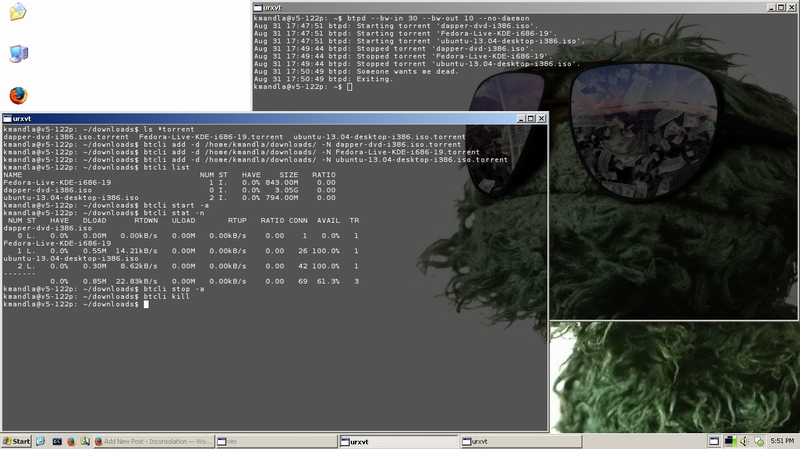 My Arch system scowled at me when I tried to build it, and a transplanted “binary” from Debian spat out errors too. But in a Linux Mint live environment, pytone gave errors on installation, which I’ve never seen before, and even a transplanted Debian version refused to work. So pytone becomes the great mystery of the decade. The next ones are either too obscure for me to set up, or I just lack the requisite wherewithal to do right by them. I’m not ashamed to admit that m9u seemed so convoluted and so meagerly documented that I couldn’t even figure on where to start. If you find something, let me know. Similarly, but to a lesser extent, Mylene escapes me. I can compile the software and I see that there have been updates even within the past months, but I don’t hear any sound. Which usually means I’ve done something wrong. vimus probably works too, but this time there were some issues installing stuff through Cabal, and I don’t know enough about Haskell to figure out what the errors were. Or how to get around them. If you get any or all of those working, or your distro has manageable copies, please tell. Science demands it. This entry was posted in Linux and tagged audio, client, daemon, music, player on 2013/07/30 by K.Mandla.